From sheet music for “Roll On, Mississippi, Roll On”, 1931. It would seem criminal to start the Spotlight feature with anyone but trio that perhaps created the jazziest interpretations of the popular music of the 1930s, the Boswell Sisters. Stars of record, screen, and radio, those “syncopating harmonists from New Orleans” simply could not sing a bad song (and could even make a bad song good). With over one-hundred recorded tunes and an established career in radio from 1930 until their untimely break-up in 1936, and an inimitable style that has never been matched, they were among the greatest musical stars of the Great Depression. Martha Meldania (born July 9, 1905), Constance Foore (born December 3, 1907), and Helvetia George “Vet” (born May 20, 1911) Boswell, born to Meldania Fooré and Alfred Clyde “A.C.” Boswell made up the Boswell Sisters. Martha and Connie were born in Kansas City, and Vet was born in Birmingham, but the family moved to New Orleans when the children were young. The sisters had an older brother, Clydie (born 1900), who died tragically in 1918 during an influenza outbreak. Around the time Vet was born, young Connie was either involved in a coaster wagon accident or stricken with polio, leaving her completely immobile for a short time, and unable to walk properly for the rest of her life. Growing up, all three sisters were given classical musical instruction from Professor Otto Finck of Tulane University. Martha learned to play piano, Connie cello (she was given a special half-sized cello to accommodate for her small stature), and Vet was taught to play violin like older brother Clydie. However, being in New Orleans, the girls were subjected to early jazz in their formative years, and soon took up a jazzier set of instruments. Connie chose saxophone and Vet took up banjo. Martha stuck with the piano. Growing up in a musical family, the sisters watched their parents and aunt and uncle sing barbershop, and before long started harmonizing on their own. The Boswell Sisters got their first taste of show business in 1919 with a performance as a string trio of angels in the passion play “Veronica’s Veil”. This was followed by a radio talent competition for WAAB, in which they won $25 each and three days booking at the Palace Theatre. In early 1925, the Sisters gained the support of vaudeville duo and recording stars Van and Schenck, who offered to put in a good work for them back in New York. On March 22 and 25, 1925, the Boswells made their first recordings for Victor in New Orleans, they recorded six songs, though only two saw release: “I’m Gonna Cry (Cryin’ Blues)”, and “Nights When I am Lonely”, both written by Martha Boswell. Around 1922, Martha fell in love with New Orleans cornetist Emmett Hardy, whose work, like that of the legendary Buddy Bolden, is unfortunately lost to time, his style reputedly resembled that of Sharkey Bonano. Tragically, Hardy’s life was cut short by tuberculosis on June 17, 1925. Martha never fully recovered from the loss. Several months after their session with Victor, the Boswells broke into Vaudeville at the Orpheum Theatre in New Orleans from August to September of 1925. Schools closed so the students could see their classmates and friends the Boswells, perform. In 1927, the girls returned to the Orpheum, and received a letter from the Max Richards talent agency inviting them to audition in Chicago (a form letter that the girls mistook for a personal invitation). Their trip to Chicago was delayed by Martha’s marriage to Jules Picard and child, as well as Connie’s throat surgery (presumably to remove singers’ nodules). The Boswells finally made it to Chicago, and tried out at the Englewood Theatre. At their audition, they were too nervous to play or dance, so they sang, at which the manager asked the question, “don’t you girls do anything but sing?” Their audition must have gone well, because the Boswell Sisters signed with the Western Vaudeville Management Company for a rigorous tour of Arkansas, Oklahoma, and Texas for $50 a show. One night in an Arkansas City hotel, Connie slipped out a bathroom window to “give her sisters a scare”. Expecting to land on a porch a few feet below, she failed to notice a gap between the wall of building and the porch, falling eighteen feet into the basement, injuring her shoulder and ankle. Nevertheless, Connie went on with the show the next day. In an interview in the 1940s, Connie stated that her injuries were minor, but she would later indicate that the incident took away what little mobility she had left. In 1929, the girls hitched a ride with fellow vaudevillians Art Wristen and Rose Doyle, and their daughter Cameo, and finally made it to California, where they met and befriended a young desk clerk by the name of Harry Leedy in a seedy San Francisco hotel. Leedy would later become their manager and eventually marry Connie. Later in the year, the Boswells got to Hollywood, where they eventually found work on the radio, and also worked “side-miking” for singers in talking pictures. Their voices can be heard in the 1930 picture Under Montana Skies. A performance on the Camel Pleasure Hour led an Oakland woman to write a letter of complaint to the station, calling the girls “savage chanters”. Hearing of the remark brought Martha to tears, but Connie convinced her that it was proof that what they were doing was new and different. During their early career, they made several transcription discs for the Continental Broadcasting Corporation in Hollywood for broadcast in Hawaii, preserving some of their earliest performances. 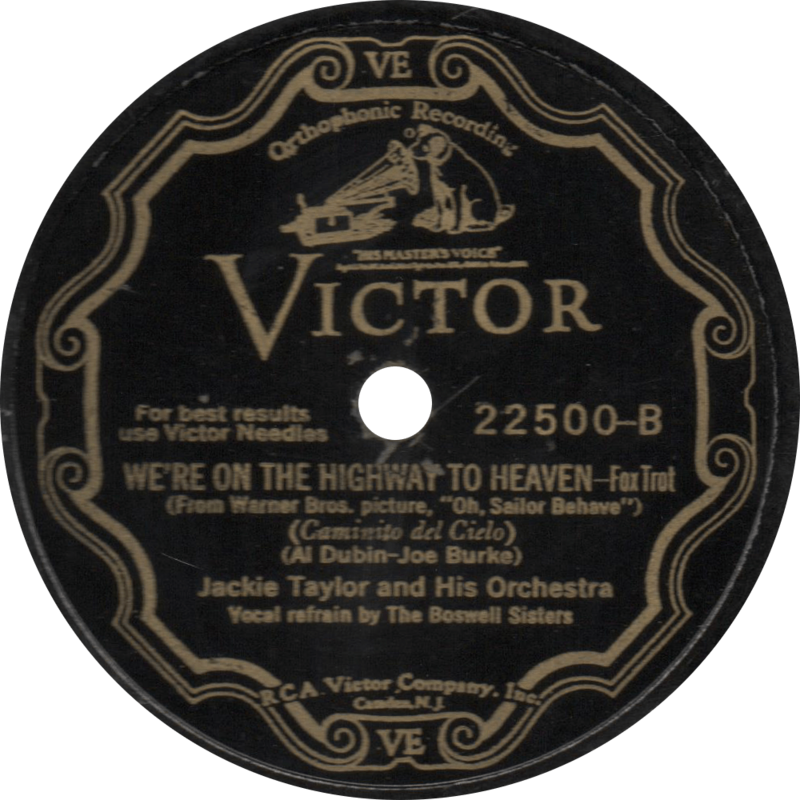 After their success on the radio the Boswells made two Victor recordings with violinist Jackie Taylor’s Orchestra in 1930, “We’re On the Highway to Heaven” from the motion picture Oh, Sailor Behave and “That’s What I Like About You”, their first since the Victor sessions in 1925, though only “Heaven” saw release. 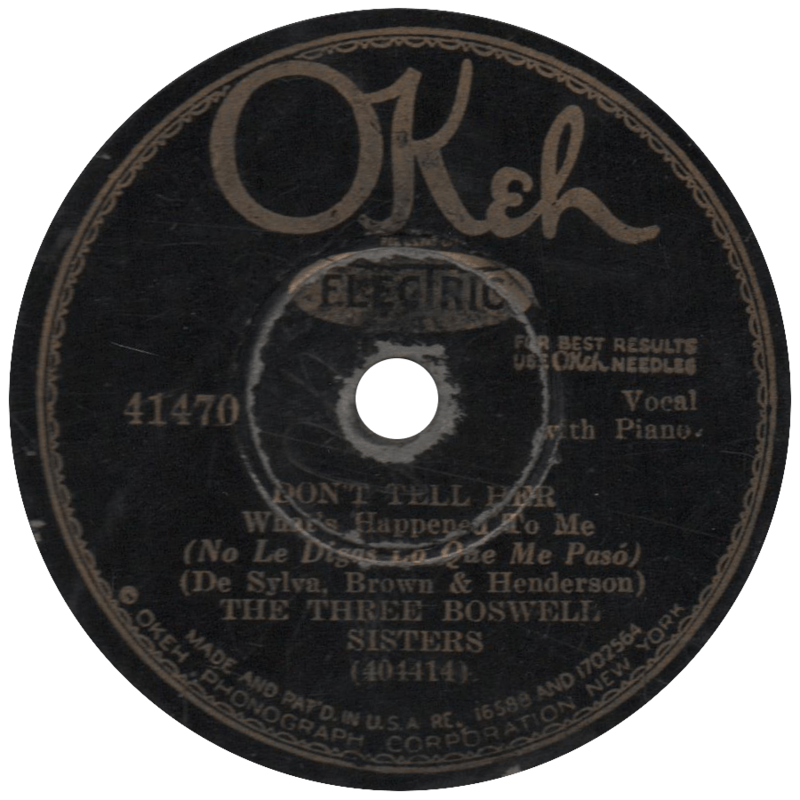 Later in 1930 the Boswells made four recordings as “The Three Boswell Sisters” for Okeh, accompanied only by Martha’s piano. These sessions included recordings of their signature tune “Heebie Jeebies”, “Gee, But I’d Like to Make You Happy”, from the film Good News, and one of my favorite Boswell sides, the excellent “Don’t Tell Her What’s Happened to Me”. All four recordings were issued on two records, as well as internationally paired with jazz recordings from greats such as Louis Armstrong and Frankie Trumbauer. 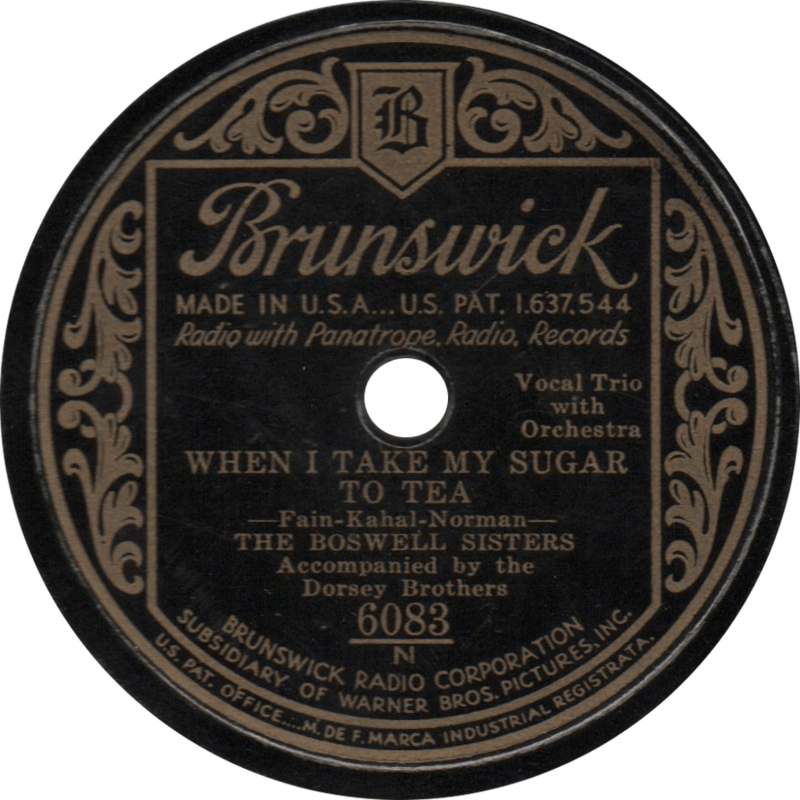 1931 saw the sisters begin their long affiliation with Brunswick Records, with whom they made most of their recordings, starting with “Wha’d Ja Do to Me?” and “When I Take My Sugar to Tea”, recorded March 19, 1931. During their tenure with Brunswick, they worked with some of the greatest talent of the 1930s, such as the Dorsey Brothers, whose orchestra served as their typical accompaniment on their earlier records. Other musicians they worked alongside included Eddie Lang, Joe Venuti, Glenn Miller, and Benny Goodman, among others. While at Brunswick the Sisters made a number of twelve-inch medley records with such talent as Bing Crosby, Red Nichols, the Mills Brothers, and Don Redman. 1931 also marked the start of the Sisters’ film career, when they appeared in the Paramount short film Close Farm-ony, serenading farm animals to persuade them to produce. Over the next few years, they would appear in a number of other shorts including Rambling ‘Round Radio Row, and Fleischer Studios’ Sleepy Time Down South in 1932, and a self-titled short in 1933. They also appeared in several features, including The Big Broadcast in 1932, and Moulin Rouge and Transatlantic Merry-Go-Round in 1934. 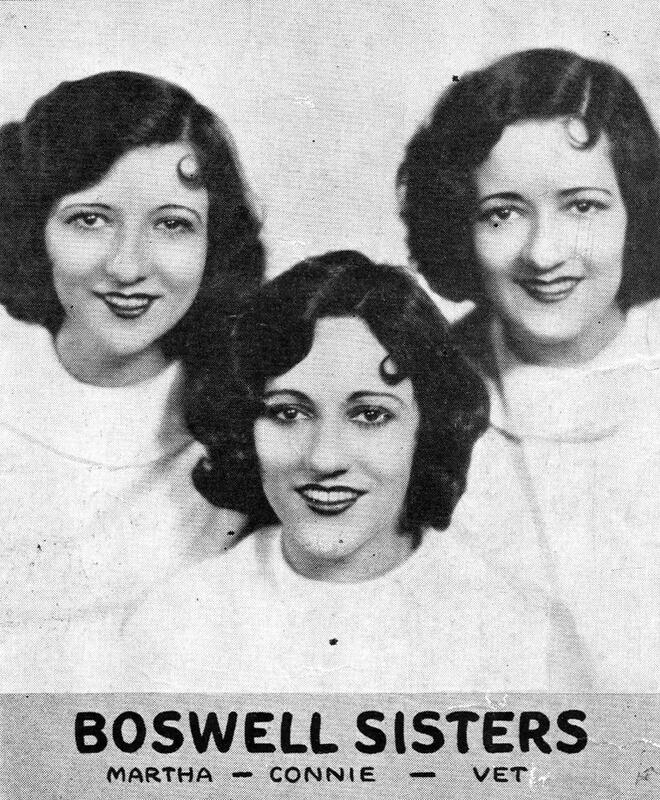 In addition to their cinematic appearances, on June 21, 1931, the Boswell Sisters appeared alongside Mayor of New York Jimmy Walker, Kate Smith, and George Gershwin on CBS’ first television broadcast. At the height of their popularity, the Boswell Sisters were billed above even the “King of Jazz” Paul Whiteman. The sisters embarked on a tour of Europe in 1933 to great fanfare. Prince George, Duke of Kent attended their shows in secret, and they were also forced to cancel some shows in the South of France when Connie came down with a case of the mumps. They later returned for a second European tour in 1935, on which Martha would meet her future husband. 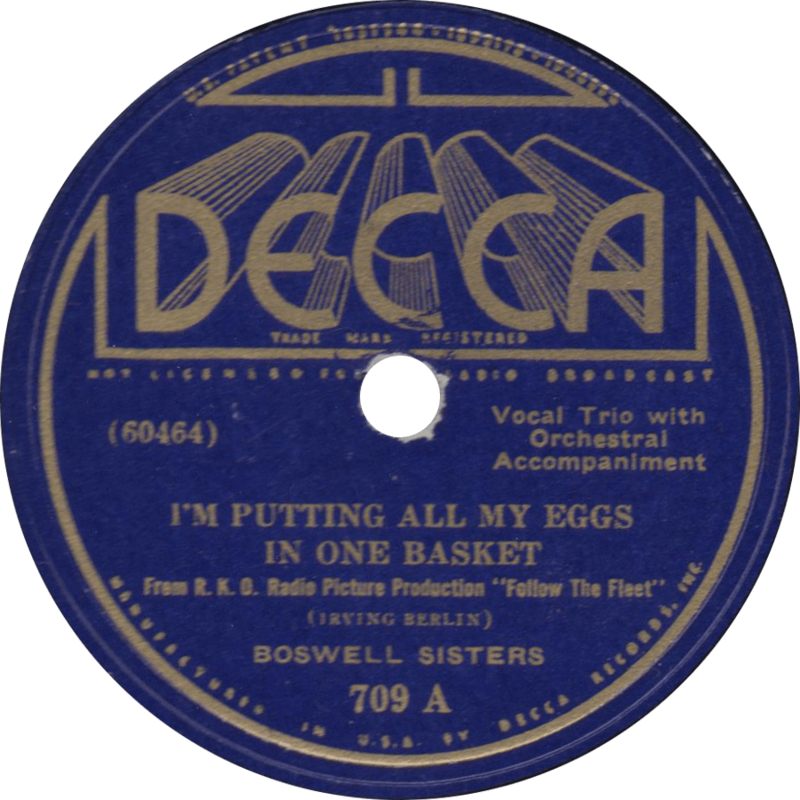 I’m Putting All My Eggs in One Basket, Boswell Sisters, February 12, 1936, their final record. In late 1935, after four years with Brunswick, the Boswell Sisters moved to the newly formed American Decca label, founded the year before by Jack Kapp, who had been their producer at Brunswick. Kapp had conservative tastes, and pushed for less “hot” styles from Decca artists. A series of marriages led to a falling out, and the act broke up in 1936, not long after they had moved from Brunswick to the Decca. Vet, Connie and Martha married in 1934, 1934, and 1936, respectively, Vet keeping her marriage secret for quite some time. After only five sessions with Decca, Martha and Vet retired from show business, but Connie continued to perform for many years to come. The Boswell Sisters recorded their final sides together, the Irving Berlin compositions, “I’m Putting All My Eggs in One Basket” and “Let Yourself Go”, both from the RKO picture “Follow the Fleet”, on February 12, 1936. After their break-up, there was some talk of a reunion, but nothing materialized, though they did sing together one last time in a nightclub in 1955. Martha Boswell retired to a farm Peekskill, New York and died in 1958 following a long illness at only 53. Connie remained in show business until the early 1960s, she died of stomach cancer in 1976 at the age of 68. Vet lived in Ontario following the breakup and stayed out of the spotlight for the rest of her life, she returned to a warm welcome in New Orleans late in life, and died in 1988 at the age of 77. While their breakup is still mourned by fans to this day, perhaps it was for the best, for if they had continued, the quality of their work may have suffered in the same way that the Mills Brothers did, owing to the studios’ pressure for the sisters’ act to be more “conventional”, and they may not have been remembered as fondly as they are today. For a detailed account of the Boswell Sisters’ life and career, I recommend reading the excellent biography The Boswell Legacy, written by Vet Boswell’s granddaughter, Kyla Titus. Updated on May 19, 2016. This entry was posted in Spotlight and tagged 1920s, 1930s, Boswell Sisters, Brunswick, Decca, Dorsey Brothers, Emmett Hardy, Jazz, Okeh, Radio, Spotlight, Van and Schenck, Vaudeville, Victor by R. Connor Montgomery. Bookmark the permalink. I enjoyed reading your article on the Boswell Sisters. I knew Vet very well and worked with Chica Minnerly and Kyla Titus (Vet Boswell’s daughter and granddaughter) on the book and research. one small error–Martha’s actual birthdate is JULY 9, 1905 (not June). Thank you very much for taking the time to read and comment on my article, I am honored that an eminent historian such as yourself enjoyed reading my humble writings. Also, thank you for informing me of my error on Martha’s birthdate, I have corrected it.